Relationships between celebrities and their adoring public are double-edged swords—they can inspire or obsess—but in the Denver Center Theatre Company's world premiere of Gregory Porter's musical, Nat King Cole and Me: A Musical Healing, we get to see the upside of such a reverential symbiosis. 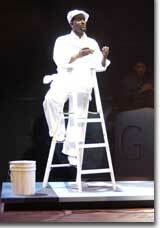 and Tyriq J. Swingler as Young Gregory. Raised by his hard-working mother and stung by his absent father's inattention, Porter spent long hours alone listening to the music of Nat King Cole. There he found solace and a father figure he could depend upon. Weaving a combination of biographical and imaginary events, Porter provides living proof of the power of music to heal and transcend difficult circumstances. We are touched not only by the real-life horrors of an unfeeling father (a painter and part-time preacher), but by the daydreams Porter uses to resolve the emotional issues that resulted from his childhood traumas. 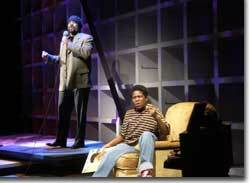 and Gregory Porter as Gregory. While the second act concert substitutes for a more thorough dramatic arc, Porter's winsome personality and singing talent, including an impressive imitation of his hero, provides for an entertaining evening. 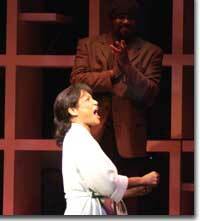 Eloise Laws, as his mother, has a voice equal to any of the great gospel and blues singers, and cuts a strong and sympathetic figure as the matriarch. Lloyd C. Porter as Father. Lloyd C. Porter, Greg's brother and accomplished actor in his own right, plays Greg's father with impressive range, from a measured, self-involved man in the non-fiction re-enactments to a jovial romantic in the fictional passages. Tyriq J. Swingler, an 11 year-old theatre student at the Denver School of the Arts, holds his own as young Greg. With a dozen songs made famous by the man with the velvet voice, a half dozen original songs by the playwright/performer, and an engaging story that speaks to contemporary single-parent households, Nat King Cole & Me makes for an instructive and feel-good evening. 303-893-4100.